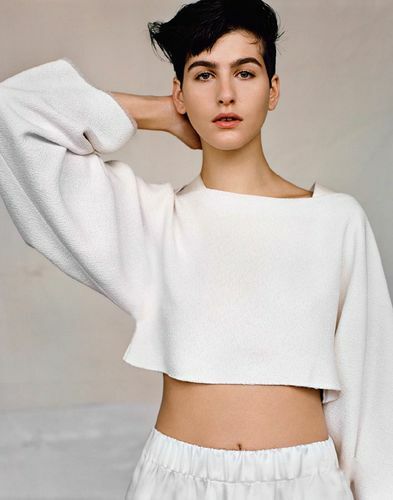 One of my favourite newcomers Athena Wilson capitalises on her beguiling runway presence with an equally enthralling editorial in the April 2013 issue of British Vogue. The 18 year old California native plays muse to photographer Alasdair McLellan showing all of the wondrous possibilities of a young Stella Tenant. Wilson's lanky 180 cm frame, über cool short hair, and mixed American/Greek background make her a compelling subject due to her chameleon-like quality in front of the camera's lens. I met Wilson during the Spring/Summer 2013 season last year at the Altuzarra casting and was floored by the multiplicity of her beauty. Wilson displays a tomboyish androgyny that is tempered by her delicate, fine features and a beauty that is non-conformist. Marching to the beat of her own drum, Wilson racked up a show tally of 35 during the recent Fall/Winter 2013 collections treading the board for Ann Demeulemeester, Mugler, John Galliano, Vera Wang, Mary Katrantzou, Julien Macdonald, and Yohji Yamamoto. Wilson's aspirational beauty appears to have struck a chord amongst designers with the model as muse holding six key opening and closing slots throughout the Fall/Winter 2013 season.